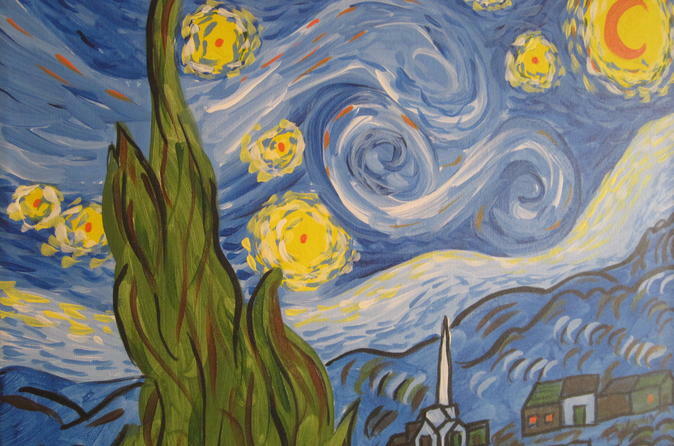 Your art class will specialize in recreating old masters including Van Gogh, Monet and Matisse among others. Many of the paintings are from the 19th century art movement called impressionism. In addition there are dozens of original works that will appeal to all tastes. This art class makes it easy for beginning painters to complete a masterpiece similar to what you've seen in museums. You will start with a template to sketch out your painting. This will give you the structure and balance needed, making the creative process easier. It’s also how you can complete paintings with a higher degree of sophistication. You will use a 16" x 20" canvas with acrylic paint to create your masterpiece. Your instructors are all working professional artists that are enthusiastic, kind, patient and committed to making it an enjoyable experience for you. The new studio is spacious and inviting where you’ll be more than comfortable. Enjoy the social, creative and relaxed environment here. But don't forget the wine! You are free to BYOB or buy at the studio. Sign up with a friend or three and make a great night of it - this is the perfect birthday party, date night or girls’ night out activity.